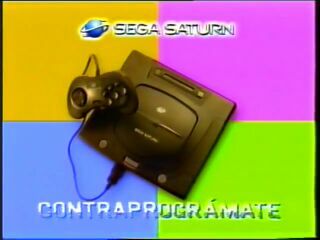 Sega Saturn: Contraprográmate is a VHS cassette promoting the Sega Saturn. It was released exclusively in Spain. The video is a largely no-frills preview of games due to be released for the system in 1997 (and 1998), including Sega Worldwide Soccer 98, Sega Touring Car Championship, Sonic R, Quake, Resident Evil, Duke Nukem 3D, Enemy Zero, Atlantis: The Lost Tales, Steep Slope Sliders, Last Bronx, Panzer Dragoon Saga, Winter Heat, The House of the Dead, NHL 98, NBA Action 98.